I actually got that response once, from an older lady (you know, probably about the age I am now) at a campground on the east coast, when I responded to her friendly where-ya-from by answering “Idaho.” Unsure whether a third-grader were allowed to correct a Grownup, I defaulted by abruptly removing myself from the conversation, and the presence of the Idiot Grownup. A few years later, at a national conference of high-schoolers, I scoffed at some other kids who asked me (entirely in earnest) whether we had electricity or indoor plumbing. the state's single north-south "highway"
Truth be told, though, I know a few people who live without either–and the public restrooms along some of our roads are hole-in-the-ground outhouses. For that matter, the single road which connects the northern and southern halves of our state is a windy little affair (often impassable due to rockslides or snow) that might not be deemed worthy of the name “highway” by folks in other regions of the country. My sister and I used to play a “Travel Bingo” game on car trips; it was a scavenger hunt of sorts, setting us to look for items in an ascending hierarchy of difficulty. But the game must have been manufactured on the East Coast, because the “easy” level included things like a traffic clover-leaf (which we’d never laid eyes on), while the most difficult level included “covered wagon” and “outhouse”… Not a game designed for Idaho, where the “tractor crossing” sign is commonplace. My other car-trip memory is my mother attempting to read aloud to us from books by Idaho outdoorsman Pat McManus. As I wrote to him decades later, when I was setting up an internet chat with the students of my “Idaho Literature” class, my mom would get to such a point of wheezing, choking laughter that she’d have to pass the book to the backseat so one of us could continue the reading. I still have my treasured copy of “They Shoot Canoes, Don’t They?“–signed by him at a Young Authors’ Conference in my gradeschool years. If you’re up for some classic Idaho humor, his books will make any fisherman howl with laughter. Back-yard-chicken classes are advertised on your street corner. There’s a Live Bait Vending Machine in front of your grocery store. The roadside signs along the highway sport bullet-holes. When it comes down to it, though, how I REALLY know I’m in Idaho is that people don’t lock their doors, and strangers smile at each other. (In fact, there’s still a law on the books in Pocatello ID that “a person may not be seen in public without a smile.”) And on that cheery note, I’ll leave you with a little bit of hard-earned Idaho Wisdom: Don’t squat with your spurs on. That’s great, I love it! We New Hampsheirites are often called hicks by the nearby Boston crowd. even though I grew up in an urban area (S. FL), I’ve spent a lot of my adult life in rural & even back woods settings. Always the best memories! My husband moved from Puerto Rico to New England in high school. Some of the students at his new high school wanted to know if the “grass hut” he lived in had been nice and did they ever wear shoes down there. Loved it. Loved it. Loved it! Whatever else Idaho is, it sure ain’t boring. I am officially subscribing to your blog! Wouldn’t miss it for the world! Idaho is my kind of place (free rifle with purchase). I keep meeting people who don’t know that New Mexico is a state and not a foreign country. Usually they went to public school (I ask). I miss the old sign *sigh* It’s so plan now. Even though I do live in Idaho we must live in very different parts of the state. I live in a tiny little town that everyone is friends with everyone (and all the animals) but no outhouses and everyone has power. Or I should say, no outhouses except for during harvest when sometimes you have to have outhouse because the nearest house is ten or more miles away. :D Either way, I love Idaho and I’m okay with what people say about it. Because it’s more awesome than their state any day. It sounds divine. I need to get me to Idaho! I grew up in South Dakota and can relate to at least some of this. LOVE the title. Loved this post! I’ve never been to Idaho, but this made me want to visit. I guess each of us in our own states have something quirky – but loveable – about them! Having grown up in Montana and Alaska, this made me giggle. Also, on our honeymoon John and I encountered some kids who were in Florida on their “Spud Break.” Which I consider a valid lifestyle choice. Lol. We visit Idaho whenever we can. Parents have property near Coeur d’Alene. No electricity, no running water, but beautiful beyond belief. Sister lived in Sandpoint a few years back. Funny how the landscape differs so from one part of the state to another, but the people stay remarkably the same. What a great post, Kana! My mom and brother live in Blackfoot, and when I was there in August, I discovered two of the most beautiful places I have ever laid eyes on. One was Driggs. I stayed in a cabin there for several days and had myself a little paint fest. One of the ladies I met while in Driggs, a local bead store owner, told me that if I wanted to do a little plein air painting, I just had to go to Felt. WOW! Felt (although I never actually saw a “town”) blew me away! Rolling hills and fields, where I was lucky enough to see a farmer meandering back and forth across his fields, producing that beautiful trail of dust just for me and my painting. Yeah, I was in heaven! I’m also surprised I’ve never seen Free Gun offers in my former home area of NW Florida. It seems a dreamland of everyone you live in. greetings. And people think us Texans are stuck in the early part of the century! Although, I do definitely relate to people having veritable “farms” in their back-yards (within city limits), including: horses, cows, goats, chickens, etc. It’s strange to go from a neighborhood, to a cow pasture and on to Wal-mart, all within a couple miles of eachother in a major Texas city. Great post! What an enjoyable post! Living in the suburbs (ugh! ), and owning a bit of rural land just a couple of counties away, I can see such a difference between the two localities. Never been to Idaho, but it sounds wonderful. That’s a cute photo of you clutching the signpost. I like the sounds of Idaho coming from the Detroit MI. area… here we lock our doors! I’ve driven through Idaho and slept in Boise. I thought it was a beautiful state! It looks as if the sign has changed since then! I loved your comment about leaving the doors unlocked and strangers saying hello to each other. I live in a small city in Pennsylvania and I remember being shocked when a stranger said hello to me when I first moved back in 2000. I had just moved back from New York City and a stranger was as likely to push you out of the way and knock you down as to say hello. Now the fact that strangers say hello to you is the thing I love the most about my hometown. Anyhow it was another enjoyable post, Kana. As always I love your humorous take on things. This post is too funny in the I-know-righ? kind of way! I have rellies spread out in Washington and Montana and can’t imagine life in the potato state is much different. I shall heed your last words of advice. From a Southern Girl (Bama to Tallahassee), the fresh bait vending machine is absolute genius! I grew up in quite a small town and much of my travels have taken me to rural settings. While I must say I enjoy rurally, I even more enjoy visiting rural locales. Live bait machines and other wonders that vary from place to place in ways that metropolises just don’t. Thanks for an eye on Idaho; now I know a little more about what I’ve missed. I’ve never been to Idaho, but I have literally eaten a ton of potatoes from there. I’ll get there eventually – I don’t want to russet. I’ve only heard good things about Idaho – including your post. Let’s hear it for laid back living! The same Idiot Grown-ups used to tell me I was from Idaho (I live in Iowa)! And my cousins from California were sure we had Indians riding the prairie along with the outhouses. Of course, growing up on a farm, we *did* have an outhouse–much to their glee when they eventually came to visit. 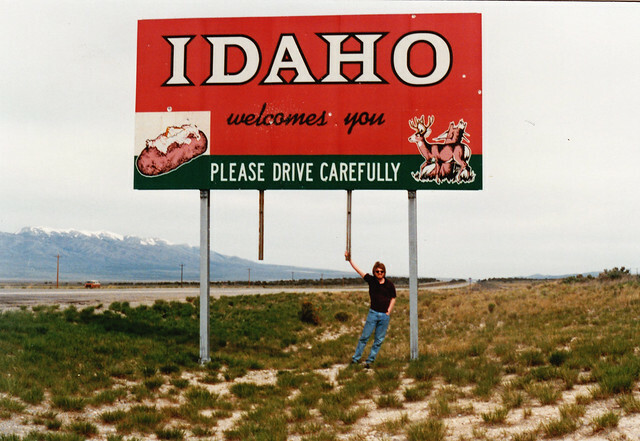 I’ve always wanted to visit the Mistaken Identity sister state of Idaho! Someday. I had to do some quick research on Boise after reading this. Wikipedia which is not known for its accuracy all the time seems to think Boise is part of the Pacific Northwest. Would you agree? Does that mean there is not an excessive amount of rain? I really want to know. I hope it’s not a silly question. Not at all. :) We’re in the “rain shadow” of the Cascade range to the east of us, so our climate here in southern Idaho is probably classified as “high desert.” I think our average annual rainfall is under 11 inches. I looked it up. Very cool! Or maybe dry. I’m from Maine where they are thinking about doing away with the spud breaks. And finally, If you find 10 degrees “a little chilly”, you live in Maine. I love all your posts and you’ve inspired me to try NaNoWriMo! I’m not sure if it’s a *good* thing if I’m to blame for someone else’s NaNo-nuttiness as well as my own… ;) Well, it’s my first go at it too–so we can celebrate or commiserate (or both, maybe?) together. Great post! And to add to it; “You might be from Alabama” if…..
1. Your wife/girfriend has jumper cables in her truck/car/jeep and KNOWS how to use them. 2. Your 4-wheeler has more miles than your truck. OOPS! PLEASE ignore the spelling error in the previous post. I had my spell-checker set to “Winston County, Alabama English”. Your recent Facebook post, with a link to this blog entry, was a great reminder to re-read your entire blog. Also a great reminder of why I love to live in this state!